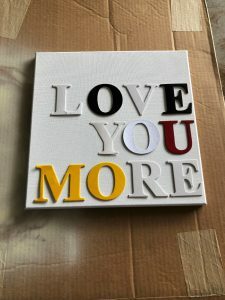 Make your own DIY quote sign in under 10 minutes. 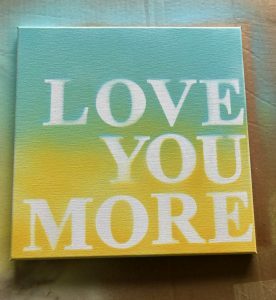 Grab a couple of supplies and make a sign to show your loved ones how much you care or hang it up in your house to show off your creativity. 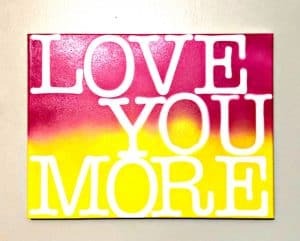 This “Love You More” sign hangs up in my daughter’s room. It’s been there for over five years now. I made this quote sign years ago with just a couple of supplies from a quote my kids and I tell each other every night before bed. The DIY sign isn’t fancy, it isn’t perfect, but it’s my daughter’s favorite. Why? Because I made it for her and it has special meaning to us. 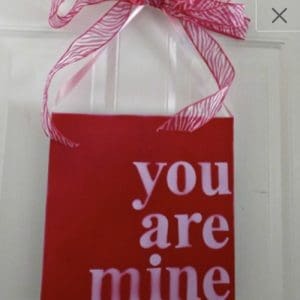 You can make a simple DIY quote sign similar to this too in under 10 minutes. 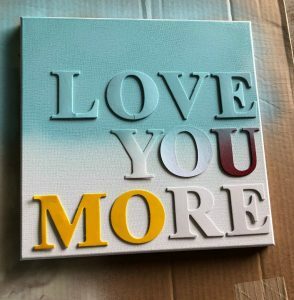 You can easily make your own DIY quote sign in under 10 minutes, not counting drying time. Gather supplies. I prefer to work in the garage (or outside) with spray paint and lay down a big old cardboard box so I don’t have to worry about accidentally spraying my garage floor. Layout how you want your letters to look. As you can see I’ve reused these letters multiple times, that’s the reason for the different colors. Begin spray painting about 12 inches from the surface. Spray directly down, not at an angle. If you spray at an angle, your letters will move and you’ll get paint under the letters. 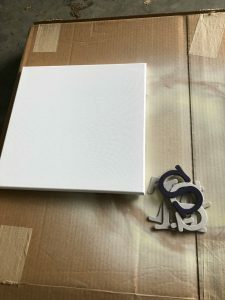 We want the canvas to stay white under the letters. Don’t worry about perfection here. If you’re using more than one color of paint, you can stop at any point. 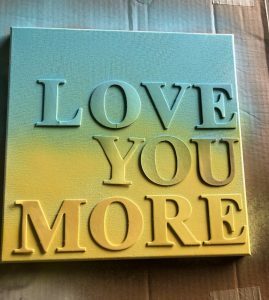 Remove letters before the paint has completely dried or else it will stick and rip the letters leaving behind residue. Be careful not to smear the paint. At this point I let the sign dry for a couple of hours then I spray a sealant and let it dry overnight at least or until the paint smell goes away. 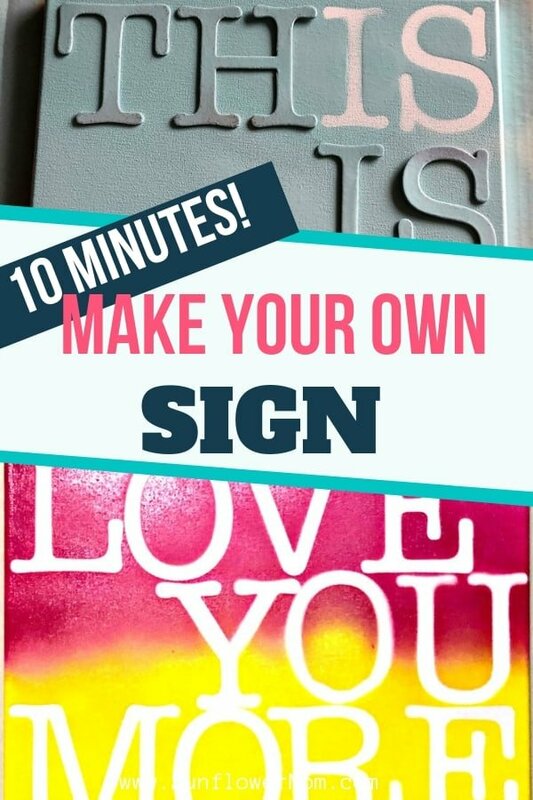 I’m not sure it even takes 10 minutes to make this DIY quote sign. Maybe more like 5 minutes. If you have limited letters you need to repeat, be careful of how you spray. Below I reused the “I” and “S”. I was careful to not spray below the word “THIS” until I moved the letters. 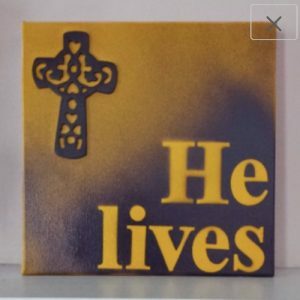 For this “He Lives” sign the canvas was originally yellow. I used purple spray paint. I used a wooden cross and spray painted it the same purple by itself first then when the canvas was dry, I glued it on. 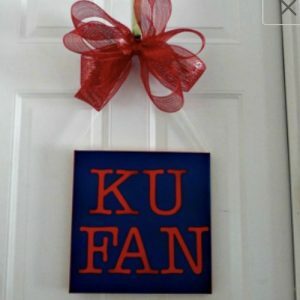 Adding bows gives a nice flair to an otherwise plain looking sign and allows you to easily hang the sign. For these below, I simply used ribbon and stapled it to the sides. 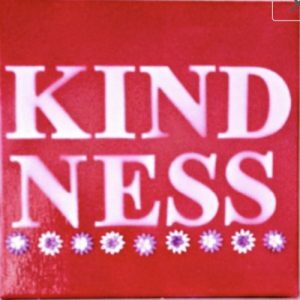 For the Kindness sign, I split the word up and added some flower embellishments and brads leftover from scrapbooking days. Possibilities are limitless. 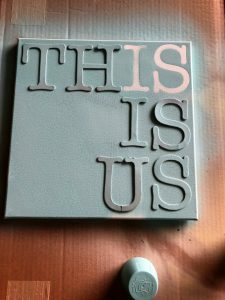 What DIY Quote Sign will you make?